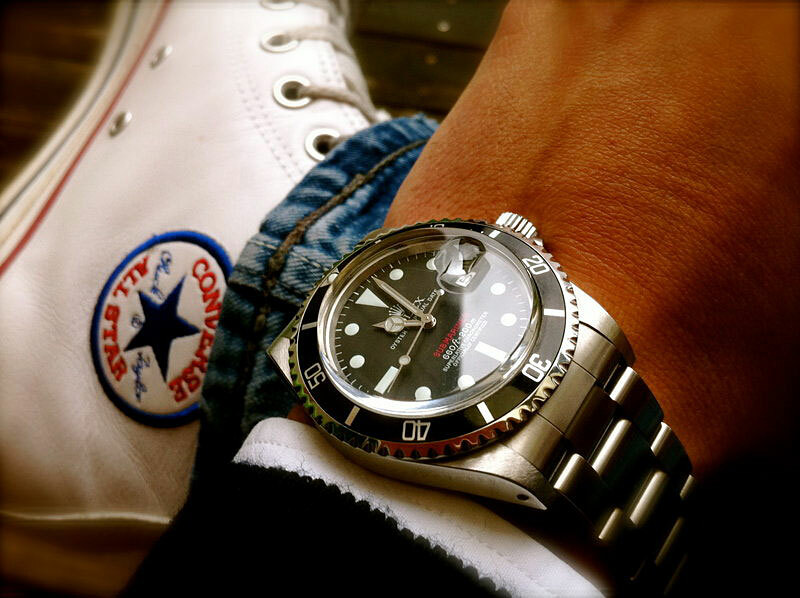 If you are a daily reader of Jake's Rolex World, you are probably familiar with Sneaker and Pant Wrist Shots. To the best of my knowledge, Bernhard (Bullibeer) who lives in the Dutch Netherlands started this trend. Who is Bernhard and what exactly is a Sneaker and Pant Wrist Shot you ask? 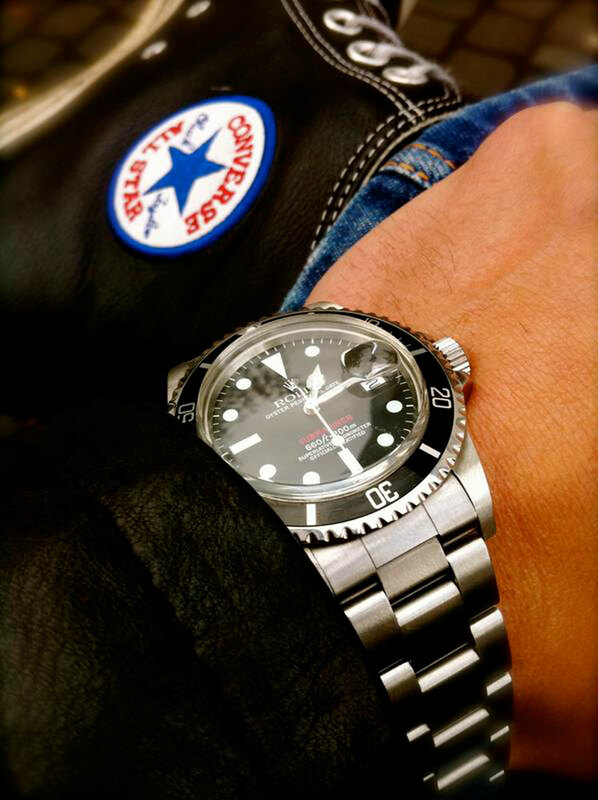 Basically, Bernhard (Bullibeer) is not only a collector of vintage Rolex watches, but he is so into them, he will basically conduct a vintage Rolex fashion show, just for himself, and he photographs these shots and posts them on the web in forums and most recently on his "100 Percent-Rolex (The Blog For Rolex Passionado's.)" I almost forgot to mention, Bernhard (Bullibeer) typically only wears vintage sneakers to match up with his vintage Rolex watches. Of course other collectors all over the world were inspired by Bernhard's Vintage Sneaker and Rolex Wrist Shots, and started posting their own. The logic with this is remarkably similar to photographing wrist-shots and posting them on the web, but the photographer takes it several steps further by showing how they match their watch with what they are wearing. It is really kind of a fashion-play for men. The photos in this set are not from Berhnard, but from Darren, who is sporting his Single Red Submariner [Reference 1680] and matching it up with some leather Chuck Taylor, Converse All Stars. So why would anybody in their right mind pose by themselves and take photos of a Rolex on their wrist and show their clothes, but not their face? I know Bernhard (Bullibeer) likes to make a shot or more of espresso before he takes the photos, so he gets all hyped-up on caffeine and takes these photo, but why? I can't speak for Bullibeer or Darren, or anybody else for that matter, but there is just something about vintage Rolex watches that is so inspirational and timeless. Something that inspires people to achieve more. Rolex watches not only tell you the time, but they also tell you something about yourself.